The 2019 Season is set for Missouri TBF! The Missouri TBF hosted the 2018 SAF Missouri High School State Championship on Saturday, April 14 at Truman Lake. A large field of excited anglers were greeted with a cruel trick from Mother Nature. A warm week of spring weather was followed up on Saturday morning with a blast from old man winter with air temperatures at launch in the low 40’s. Temperatures continued to drop all day with winds switching to the north and blowing at 15-25 mph. This made for a tough challenge for our field and scratched many anglers plans of making any long runs up the Grand or Osage arms to find warmer water and early spawning fish. While the weather may have been unpleasant, it did not deter a huge field of young, enthusiastic anglers from hitting the water in search of largemouth and spotted bass. With the help of Missouri TBF’s new partners, National Youth Fishing Association (NYFA), the event attracted a field of 272 teams! This was truly an amazing turnout and a testament to the enthusiasm for high school fishing in Missouri and the quality of the event. The event had outstanding support from the TBF national office, NYFA staff, local TBF volunteers and Long Shoal Marina. With the generous support of TBF National sponsors (Lowrance, Ranger Boats, Hummingbird, Minn Kota and Cabelas), state sponsors (Lews & Dobyns Rods) and individual TBF members (Ken Whitfield, Don Heiser and Patrick O’Neal) Missouri TBF was able to give every participant the opportunity to enjoy the fishing and take home several additional prizes. Topping the field was the team of Zak Hobbs and Tristian Konenik from Seckman High School (Imperial) with 5 nice keepers for 16.62 pounds (anchored with a 4.67 pounder). They caught their fish using a white spinner bait (Indian and Colorado blades). The cold-water temperatures (48-49 degrees) made fish lethargic but they were able to trigger strikes by working the bait slower. They paired the spinnerbait bite with a white bladed jig using a swim bait trailer. Slow rolling the bladed jig triggered some of their bigger bites. They concentrated on water 4-8 feet deep, focusing on secondary points in a specific cove near the dam. This cove had several wind-blown secondary points which attracted staging fish moving in looking for early spawning spots. They stayed in the same cove all day, bouncing from point to point covering all angles of the point. Since this was the only place on the lake they found active fish they decided to grind it out. Both anglers wanted to say a thanks to their boat captain for sitting out there all day in the cold and helping to keep them focused in very tough conditions. In addition, they wanted to thank their sponsors 13 Fishing, The Rod Glove, Duns Sporting Goods, and Woo Tungsten. 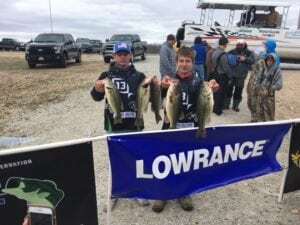 Coming in second was a team from Mansfield High School of Dawson Barnett and Holden Dennis, bagging 4 fish for 16.11 pounds anchored by a big bass of 6.31 pounds. They caught all their keepers using a spinner bait and home-made jig. They had a total of 6 keepers and several shorts mostly fishing up the Tebo Arm. The third-place team was made up of Devon Rathbun and Caleb Haines from Parkview High School (Springfield) with a sack weighing 15.45 pounds. They used a citrus shad and chartreuse/black square bill to catch most of their fish but also threw a spinner bait and rock crawler. Bites were tough with only 8-9 fish but 6 were keepers and proved to be the right size. They ran up the Grand arm to some dirtier water and found a warm cove with 55-degree water. They would like to thank their sponsors and especially their boat captain, Russel Hand, for making that long 20-minute run on a very cold day. Finishing fourth, was local favorites Rider Smith and Austin Hansen from Lincoln High School with 4 fish for 15.25 pounds (big bass of 6.32). Finishing fifth, was River Clunn and Zack Pierce from Ava with 5 fish weighing 13.99. The big bass of the tournament was caught by Cater Fletcher & Jesse Anthony with a 6.51-pound lunker. The big female hit a Megabars Jerk bait in pocket on a transition bank from chunk rock to gravel. The outstanding turnout and commitment by the anglers means that Missouri will be able to send 27 teams to the High School Fishing National Championship. This outstanding event will be held at beautiful Pickwick Lake in Florence, Alabama from June 26-30. Contestants will not just be competing for a national title but also for scholarships and prizes such as laptops, gift cards, big screen TV’s, rods/reels and more. Check out our website to register and learn more at: www.highschoolfishing.org/2018-high-school-fishing-world-finals-and-national-championship-combined-event/. The Missouri TBF would like to thank all of the participants for their support and cooperation. The anglers showed great sportsmanship and patience, which is required with such a large field of contestants. We are sincerely looking forward to having this next generation of anglers advance through the college ranks and into our adult TBF clubs.